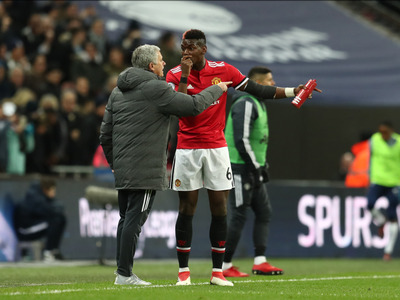 Catherine Ivill/Getty ImagesManchester United star Paul Pogba and manager Jose Mourinho having an exchange during a recent English Premier League match. One of the highest-profile players in soccer, Paul Pogba, did not start a high-profile match on Wednesday. Pogba has been missing playing time amid rumours of tension between him and Manchester United manager Jose Mourinho. At least one report claims Pogba is trying to leave Manchester United altogether. Wednesday’s Champions League matchup between Manchester United and Sevilla FC once again featured the conspicuous absence of star midfielder Paul Pogba from the United starting lineup. For a player of Pogba’s stature – it was only about a year-and-a-half ago that Pogba commanded a then world-record transfer fee when he signed with Manchester United – to not start in such an important match is an odd turn of events to say the least. That same ESPN FC report also notes that Pogba had been missing an unusually high amount of playing time over the past month. This latest development adds credence to the rumours that have been circulating that there is tension between Pogba and United manager Jose Mourinho. If Pogba were to leave United, this would mark his second failed stint at the club, as was previously with the club from 2009 to 2012, but left when he found first team minutes hard to come by. Pogba returned to the club in 2016 in part because he felt he had “unfinished business” with United.